Social Class: How Does it Work? Class differences permeate the neighborhoods, classrooms, and workplaces where we lead our daily lives. But little is known about how class really works, and its importance is often downplayed or denied. In this important new volume, leading sociologists systematically examine how social class operates in the United States today. Social Class argues against the view that we are becoming a classless society. The authors show instead the decisive ways social class matters--from how long people live, to how they raise their children, to how they vote. The distinguished contributors to Social Class examine how class works in a variety of domains including politics, health, education, gender, and the family. Michael Hout shows that class membership remains an integral part of identity in the U.S.--in two large national surveys, over 97 percent of Americans, when prompted, identify themselves with a particular class. Dalton Conley identifies an intangible but crucial source of class difference that he calls the "opportunity horizon"--children form aspirations based on what they have seen is possible. The best predictor of earning a college degree isn't race, income, or even parental occupation--it is, rather, the level of education that one's parents achieved. Annette Lareau and Elliot Weininger find that parental involvement in the college application process, which significantly contributes to student success, is overwhelmingly a middle-class phenomenon. David Grusky and Kim Weeden introduce a new model for measuring inequality that allows researchers to assess not just the extent of inequality, but also whether it is taking on a more polarized, class-based form. John Goldthorpe and Michelle Jackson examine the academic careers of students in three social classes and find that poorly performing students from high-status families do much better in many instances than talented students from less-advantaged families. Erik Olin Wright critically assesses the emphasis on individual life chances in many studies of class and calls for a more structural conception of class. In an epilogue, journalists Ray Suarez, Janny Scott, and Roger Hodge reflect on the media's failure to report hardening class lines in the United States, even when images on the nightly news--such as those involving health, crime, or immigration--are profoundly shaped by issues of class. Until now, class scholarship has been highly specialized, with researchers working on only one part of a larger puzzle. 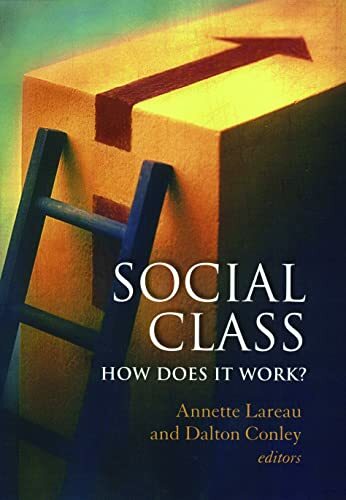 Social Class gathers the most current research in one volume, and persuasively illustrates that class remains a powerful force in American society. ANNETTE LAREAU is professor of sociology at University of Maryland, College Park. DALTON CONLEY is University Professor at New York University. 1. Social Class: How Does It Work? 5. Social Class: How Does It Work? 8. Social Class: How Does it Work? 10. Social Class: How Does It Work?